Well, I know that some players have defeated all the Elementums, some need only Wind more… Some need 2 or all… This post is for that players what Miss Some Elementum! Enjoy! Well, for all the Elementums it’s easy if you have 30 level Miscrits. Ok, let’s start with Earth Elementum! Suggested team: Elefauna 7 level – must have, for Pollen and lowing accuracy! And other 3 suggested from me are: Thundercracker, Flue, Dark Flue.. Not important who of that 3 – but will be nice and sure if you have 2 of that 3 suggested. Let’s start! Match is started. In first spot you must have Elefauna and to start to use Pollen – lowing accuracy -10%. If case if Elementum will beat you on first try, you must heal again or to wait 1 hour to be back, but, if Elementum will MISS you will repeat Pollen and that will repeat 4 times (Elementum must be -40% accuracy). When you will success lowing accuracy -40% you can put Thundercracker or Dark Flue/Flue. If you will use Thundercracker, you must use SLUDGE (Lowing defense -11) or if you use Flue or Dark Flue, you must use DEBILITATE (Same, lowing defense -11). Elementum is allready -40% accuracy and you will use lowing accuracy and to make him -81 or near of that defences. When you will have him -81 (or near) lower PHYSICAL DEFENSE (Elemental is not possibble because he is using +ED) you will attack the Elementum with Mighty Bash/Dark Mighty Bash or Mace Smash (depents what Miscrits you used). With -81 Physical Defense of Elementum and Physical Attack from Thundercracker or Flue/Dark Flue you will beat the Earth Elementum with one hit (-1000 hp). Good luck! Nature Elementum is the easiest Elementum of all. If you have team of level 30 Miscrits will be too easy for you. The best way is to use Miscrits who can lower defenses. I will get again Thundercracker or Flue/Dark Flue. Use Debilitate or Sludge and repeat that only 4 times. When you will have Nature Elementum -44 Physical and Elemental Defense, you can attack him and to beat him with only one hit too. Good luck! Well, I allready expained how I beated this Wind Elementum. All what you need is: Mun Kee in your Team, Thundercracker and 2 more Miscrits from your choice. You will sleep the Elementum with Mun Kee’s Deep Sleep and you will pick the Thundercracker and you will use Sludge (lowing all defenses -11). When Elementum will poison your for 99 turns you will pick again Mun Kee and will try to sleep. In the whole game the same – picking Mun Kee and Thundercracker. When Elementum will beat your Mun Kee and Thundercracker, than you still have 2 Miscrits from your choice. From Thuncercracker you have The Elementum – all lower defenses and you can attack him. If you want whole match preview, you can write on YouTube: How to defeat Wind Elementum and there you will see so many Strategies. Good luck! Maybe the first Elementum of Volcano Island, but to be honest it’s not that best challenge for us. Apollo Nox didn’t gave us one more enourmous monster this time. 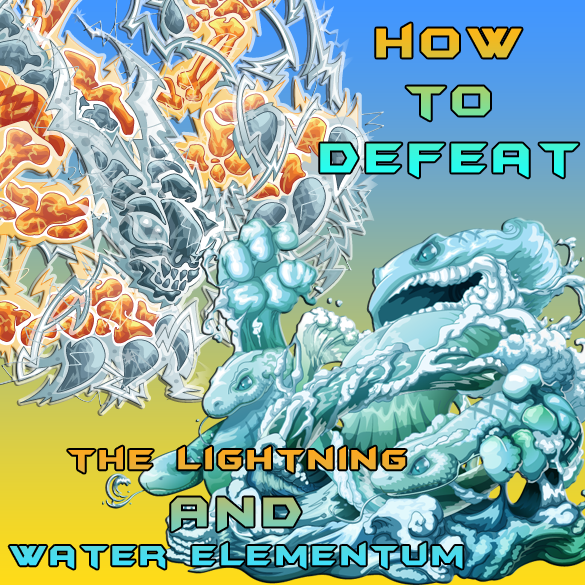 The Water Elementum it is very easy to defeat, and my suggestion is to use miscrits level 21 – 30, not earlier. The best way is: First of all, lower his attacks. He have pretty great attacks, witch can destroy you very easy if you will not lower them. -40 Water Elementum’s defenses it is enough. When you will lower them, the next step is again lowering, but now his defenses. Again my suggestion for lowering is -81 or more, but -81 it is enough. Then, attack him and you will defeat him with only one hit – K.O. -Well, well, well. The Lightning Elementum is not the biggest challenge and the hardest elementum ever as they have said before. The Lightening Elementum can be found on the top of Monk’s Mountain and if you have full Level 30 team is easy to defeat. In case if you have many level 30 miscrits, than my suggestion is to choose that 4 miscrits which have the highest Elemental Defence. After you choosed it, you are ready for battle. The Lightning Elementum is immune of confuse only, so that means that as a help in the fight you can use Demage over time, Venom/Poison and (Deep) Sleep. Quartex have very good Elemental Defence, but don’t choose for your team because he haven’t very high attacks and he can’t use his mighty Complete Confusion. Dark Bubbles can help with the Deep Sleep and lowing Elementum’s Defences. If you choosed the strategy for lowing defences, than make sure that you will lower ’em on -50 or -70, for bigger demage. Than just attack, attack, and attack. In case if you think that you are losing, don’t give up, and use some heals, but I think that it will not bе necessary. Good luck! sparksepeck (L 30), squibee (L 30), Tulipinny (L. 30) and gippo (L. 30) is a strong team ?